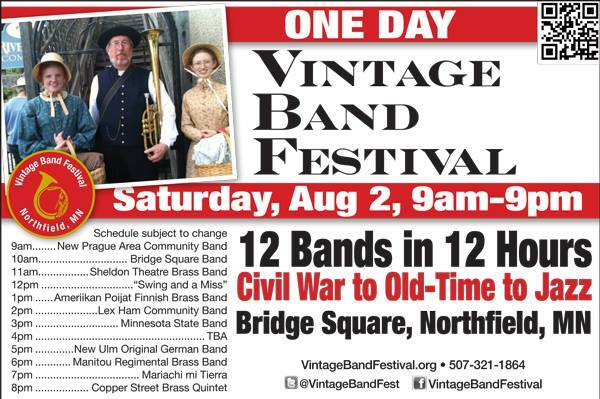 Vintage Band Festival is presenting a one-day event on Saturday, Aug. 2, 2014. With musical styles ranging from Civil War to Old Time to Jazz and more, 12 diverse bands from around Minnesota will perform outdoor concerts on Northfield’s Bridge Square starting at 9 a.m. and going until 9 p.m. The event will be held in conjunction with Northfield’s Riverwalk Market Fair in Bridge Square, where arts, crafts, and fresh foods are available. The event is free and open to the public, but donations to VBF are greatly appreciated. The next full four-day Vintage Band Festival will be held July 28-31, 2016, following a successful festival in August 2013.
should contact vintagebandfestival@gmail.com or 507-645-7554. @vintagebandfest For more information, please visit vintagebandfestival.org.